When the summer vacations are around the corner, we are sure that you are thinking about what to do in Navi Mumbai for a vacation. While you may have plans for long vacations, other alternatives are a visit to a water park nearby. There is plenty of fun to be had at a water park – the kids can enjoy the rides, while you can enjoy swimming and games at the pool. If you are in Navi Mumbai, you have the chance to visit some of the best water parks in India. We give you the top 11 water parks in Navi Mumbai that are a must visit for anyone looking to have a big splash in the summertime. The Shivganga Water Park is one of the few water parks situated in Panvel where you can enjoy plenty of water slides and the pool. You and the family will love the tube and family slides, which are a lot of fun. Those looking to give water rides a miss can try the mini-train or choose to play indoor arcade games such as air-hockey and a few video games. Head to the canteen inside the park to enjoy sumptuous meals followed by a long walk in the gorgeous garden. There is a parking available at the park. Situated close to the Karnala Bird Sanctuary, the Panoramic Resort and Water Park is a good option for a one-day outing for those looking to enjoy at a place that is not too crowded. The resort is equipped with two water slides and a pool where families and individuals can have tons of fun. There is also a restaurant and banquet that both serve delicious food to satisfy your hunger pangs. Not a big water park in Navi Mumbai, but still fun for the family. If you are looking for a place to unwind and enjoy world-class water slides, visit the Imagica Water Park in Navi Mumbai. Part of the Imagica Amusement Park, this place has an array of interesting water rides to enjoy. You have rides that bring thrills, rides that will make you scream at the top of your lungs, and rides that zip, zap, and zoom. Those looking for something less exciting can enjoy the relaxed float rides at the Imagica Water Park. This water park is one of the oldest water parks in Maharashtra. Home to amazing rides, you are sure to have a fun in the sun at this amazing water park. There are plenty of water activities for you and the family to enjoy; you can have fun on the lazy river or enjoy water games at the pool. Kids can have plenty of fun at the kiddies pool or even company you on the family slide. To satiate your hunger from all the slides and water activities, there is a poolside restaurant that serves delicious vegetarian food. At Ammu Water Park and Resort, you are sure to have a tonne of fun, all thanks to the fantastic rides and slides they have here. The highlight of this water park is that has ten water slides, each with a different experience to enjoy. Professional swimmers will love their experience of swimming inside the deep pool at the Ammu Water Park and Resort, while kids can enjoy at the kiddies’ pool. Yet another park in Thane, the Suraj Water Park has received many awards. Spread over 11 acres of land, the water park has many slides and rides to enjoy for everyone. If you are adventurous try out the Ulatpala and the Ding-dong slides that are exciting. Those looking to just enjoy themselves can check out the artificial cave and the Har Har Gange waterfall. Please note, swimwear is compulsory for all slides, though there is no restriction on outfits at the pool. The highlight at the Nishiland Water Park is its wave pool. Swimming at the pool will make you feel as if you are swimming in the sea. Apart from the wave pool, at Nishiland Water Park, there are a couple of water slides to enjoy. Those looking to unwind can relax at the very calm Rub a Dub Jacuzzi. There is also a big children’s pool at this water park. Spread over fifteen acres of land, the Shangrila Water Park is a great place to go to for a picnic during the monsoon. Featuring water slides, a rain dance arena, and a huge pool, this water park is everything that a water lover needs to have a good time. Please note that wearing swimwear inside the pool and on the slides is compulsory, if you don’t have swimwear, you can either purchase or rent it out at the resort. The Anand Sagar Water Park is situated close to the Arnala Beach. In fact, a portion of the water park is on the beach. At this park, you can choose to either enjoy the many water slides and activities or just laze around at the beach, or if, you prefer, do both. There is also a rain dance party that takes place at the water park and some restaurants serve delicious local food. Located about an hour’s drive away from Navi Mumbai, the Great Escape Water Park has many water slides visitors can enjoy. The best part of this water park is that it has something to offer for the entire family. While the young can enjoy the water slides, elders can relax on the cots and comfortable benches that sit in the shade. 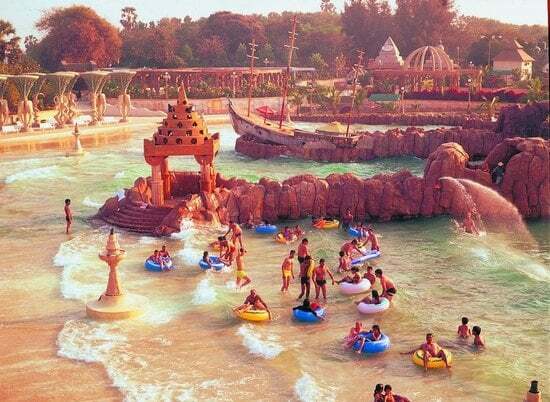 One of the best places for a one-day picnic is the Water Kingdom park in Mumbai. Offering loads of great water slides and rides, you are guaranteed to have fun at this water park near Navi Mumbai. Open all year round, the park has been one of the most popular among picnickers who not only come to enjoy the water slides but also to enjoy the lovely ambience of the park. Whether you are looking to go for a picnic with your family or with some friends, these water parks are an excellent way to spend the entire day. They offer a plethora of experiences and have all the best facilities for a fun, enjoyable day. With so much to do at these water parks in Navi Mumbai, we are sure that you won’t get bored easily. If you planning to visit Navi Mumbai, stay at one of these hotels in Navi Mumbai. If you planning to visit Navi Mumbai during your trip to Mumbai, then make your trip comfortable by staying in one of these hotels in Mumbai. What are your favourite things to do at a waterpark? Do you love the pool or are you the type to enjoy only the water slides? Do let us know in the comments section below.